The idea to create the Laura Foundation for Autism and Epilepsy came with the passing of Laura (Hoyt) Mahoney in April of 2008. Our family wished to keep her memory alive through a charitable organization. It had to be a cause that Laura would believe in whole-heartedly, one that would make a difference in someone’s life. Her greatest loves were her grandchildren, and one of them suffered from both epilepsy and autism. As a result, Laura knew first-hand how devastating these two disorders were on the afflicted individuals and the families caring for them. We knew that Laura would stand behind any effort or organization trying to help these families, thus our Foundation was formed. We’ve broken our goals for the Laura Foundation for Autism and Epilepsy into phases. Thanks to the generous donations of family and friends, Phases 1 and 2 are complete. Our focus is to bring adaptive sports (horseback riding, climbing, biking and so on) to a centralized location in the Mount Washington Valley. 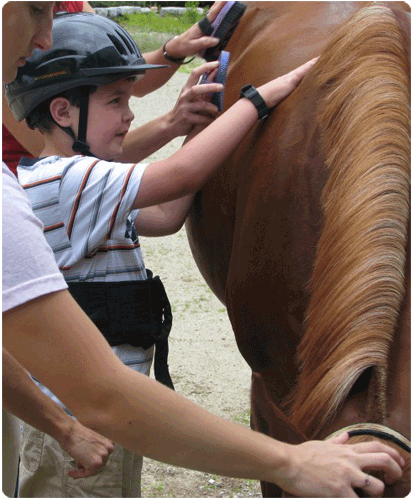 In July of 2009, adaptive horseback riding became available in Madison, NH. The Laura Foundation built the initial infrastructure, including things such as fencing, needed to make therapeutic riding a reality. From there, summer programming began in 2012. In 2014, with the completion of Phase 1, year round programming began. Currently, programs that range from social skills and life skill training to snowshoeing and ball sports run up to six days each week. Donations have given us our start, and in the coming months and years we will have many fundraising events. We hope that you’ll be a part of our efforts!